The work is announced in an early self-portrait, the face in profile like Piero’s Duke of Urbino, the body partly turned to the viewer. A rocky landscape rises behind the figure, under a yellow sky. The technique suggests Benton and the Italians at once. Dali the realist and Dali the fantasist both figure in the Thirties and Forties, by which point a settled matter erupts into an illumination. There is the body of work established in California by those who call themselves Impressionists or Post-Impressionists, among whom Conrad Buff may be looked upon as an example. Also and equally clear-minded is the approach to a similar rationality with regard to the fundamentals of painting itself. These two streams of consciousness sprung from the Fifties conjoin in the Sixties as her landscapes, a unified field theory of great articulation bringing to bear a tremendous force of power by way of compositional control on forms that isolate and express a direct, cogent utterance. The road is in light, or part is in light. Desert Road (Landscape), a work painted in 1960, compositionally anticipates Diebenkorn’s Ocean Park. A high horizon line, a cloudy sky, a dark ocean, a shaded road and the blinding sunlight on the road before the viewer are delineated in eight color fields. 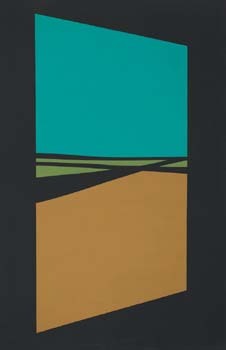 The Poet’s Road (1961) is all in shade to the horizon but forks a bit and finds a sunny patch. The grand design of Triptych (1963) reveals a curve and obscurity of abstraction that are frankly Polynesian. Here are the river valleys, around the same time, that fork and split. 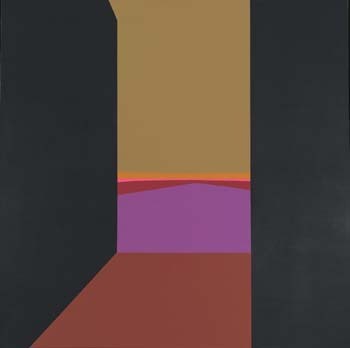 Open Door and Evening (both 1964) eradicate the apparatus, or fold into seeing the means of seeing. This has indescribable consequences, yet the apparent easy relationship to O’Keeffe, Buff, Riley, etc. is an oblique one as well. 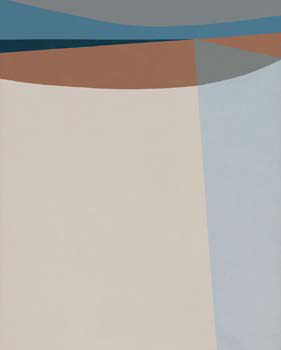 Tidelands (1967, reproduced on the cover of the catalogue) is an odalisque and a beach and an Agnes Martin study all at the same time, while aspiring to the flat sameness of the seascape. The mystery of interior constructions is done away with, this is the attempt to render in placid colors and reduced elements all the force of nature, as it were. There is a road in the sky, or a track, that mirrors the one to the horizon. 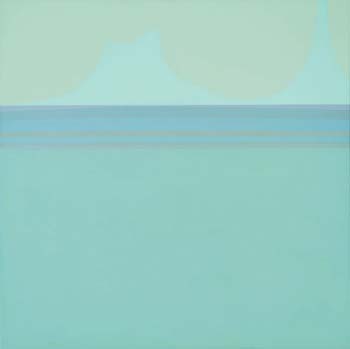 Very shortly, Lundeberg will be found to have attained maximum clarity in such works as Ocean (1979). These are works that almost are not there, so mitigated is the color contrast, so delicate the nuance, so particular the curve, and yet the propulsive force of the minutest degrees of variation and slight introduction of anterior elements suggest the correct approximation of the natural order, at least. Darwin was a naturalist who could tell the thing you’re standing on within a few million years of its actual history. Lundeberg has her landscapes of the desert and the coast, between which she lived and had her career, and those which are of painting and other things as well. She saw the city’s progress in the American fashion “from barbarism to decadence,” within a certain framework of ideas and considerations. These do not give way to such notions as influence and garnering of fame. She painted in Southern California, an artistic capital renowned for its philistinism. These are the conditions of her art. But in what sense are her paintings conditioned by anything at all? We try to describe things as they are. These colors are a thing, pushed onto the canvas. A state of mind, “the joy of a wall,” mountains, islands, waterways.